Today’s news review looks at coverage of the Key Stage 2 results we released yesterday. Yesterday the Department published the results of this year’s Key Stage 2 tests and teacher assessments. These are the first results to be released under the new tougher primary school curriculum, introduced in 2014. 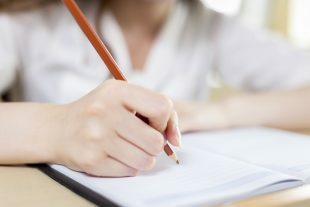 74% of pupils met the new expected standard in writing. We have made it absolutely clear that the results are not comparable to those from previous years because this is the first year we have assessed pupils under the new more rigorous system. Most of today's media coverage makes this important point clear and the Guardian, the Mail, the Times and the Telegraph all report that in individual subjects the vast majority of pupils reached the expected standards. Russell Hobby, General Secretary of the NAHT, is quoted in the Mail incorrectly saying that children are being branded failures – this is not the case. Key Stage 2 results are used to measure pupils’ progress in order to assess how schools are performing and whether individual pupils need extra support. Key Stage 2 results do not follow pupils through their school careers and not meeting the expected standard should not be an indicator of failure, these are simply a reflection of how well children this year have performed against a new curriculum. Nothing is more important than ensuring that young people master the basics of reading, writing and mathematics early on. The simple truth is that if they don’t, they’ll be left playing catch up for the rest of their lives. That’s why as part of this Government’s commitment to delivering real social justice, we have raised the bar on what counts as a good enough standard in the 3Rs for our children by the end of primary school. We know we are asking more, but we’re doing that because we are committed to giving young people the best start in life - and today’s results show there is no limit to pupils’ potential. This is the first year we have assessed pupils under the new more rigorous system and it is no surprise that this year’s results look different to previous years but despite that the majority of pupils have achieved above and beyond the new expected standard. I want to thank all those involved in the tests this year – including teachers and parents – for supporting pupils through the transition to a more rigorous system. It is important that all involved see these results for what they are – a reflection of how well children this year have performed against a new curriculum. I believe this is a good start that vindicates our decision to raise standards and will help ensure those who need extra help get the support they need to lay the foundations for a bright future. For more information on primary assessment, have a look this information for parents published by the Standards and Testing Agency in June and our article on five things you need to know about primary assessment.